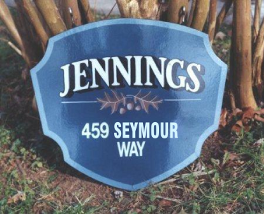 Personalize your home in a special way with a residential sign. It will inform and set a tone of sophistication or fun. Think of what a very unique gift this will make for friends and family. Available with reflective graphics. This is an actual sign, the street name has been changed to protect privacy.